Chennai floods devastate India’s fourth-largest city. An Indian man shelters under an umbrella as he walks through floodwaters in Chennai on December 1, 2015, during a downpour of heavy rain in the southern Indian city. 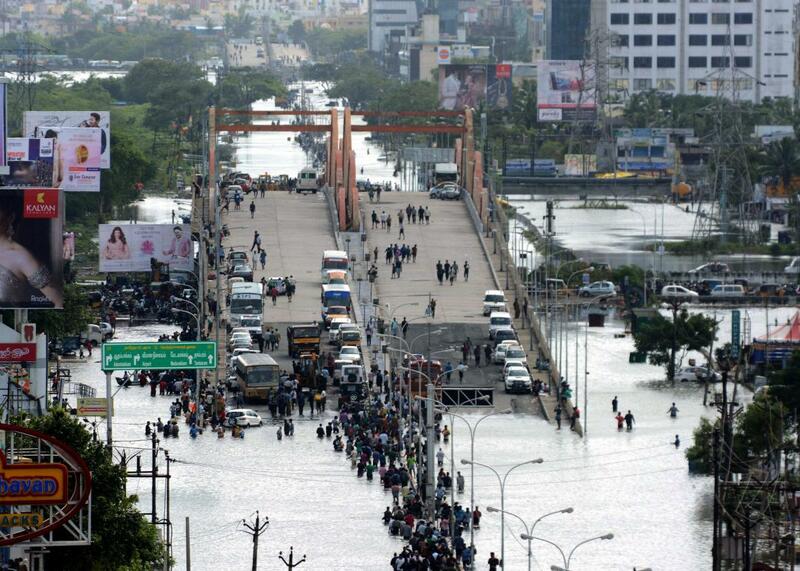 Right now, Chennai—India’s fourth-largest city with a metro area the size of Chicago—is paralyzed. Flooding from record rainfall—the heaviest in more than a hundred years—has cut off more than 3 million people from basic services for days. At least 270 people have died, and what’s happening should provide a cautionary tale to the world: Chennai is a new type of “natural” disaster, a preview of the Anthropocene, the idea that humans have become a geological-scale force of nature. 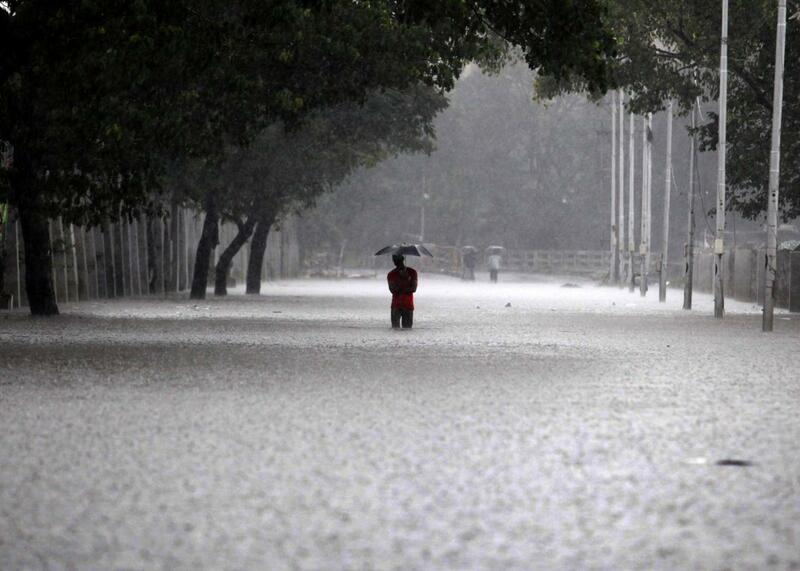 November was Chennai’s rainiest calendar month in history: An unimaginable 47 inches fell. Then, this week, things got worse. Wednesday’s rains brought an additional 11 inches—34 times the normal amount. More rain is expected in the coming days, linked to an enhanced northeast monsoon boosted by a record-strong El Niño in the Pacific Ocean and the record-warm Indian Ocean. Flooding is nothing new in Chennai—major floods have occurred there in 1903, 1943, 1978, 1985, 2002, and 2005—but it’s very likely that enhanced evaporation linked to climate change has contributed to this week’s tragedy, making heavy rains more likely. The country’s lead meteorologist as well as its prime minister, Narendra Modi, have both endorsed this linkage. Indian residents and motorists gather on an overpass as others wade through floodwaters in Chennai on December 3, 2015. But there are deeper reasons these floods happened where they did. Like New Orleans in 2005, Chennai has a sharp and growing rich-poor divide, and is near sea level—at the front lines of climate change. Photos of people awaiting rescue from rooftops and highway overpasses are eerily similar to post–Hurricane Katrina New Orleans 10 years ago. Unlike New Orleans, Chennai has a booming economy. Chennai has become one of India’s primary information technology and health care hubs, though like many developing country megacities, its infrastructure has strained to keep up with the rapid growth. For a city built on a floodplain, development has essentially gone unchecked: Critical infrastructure—like the airport, automobile manufacturing plants, and IT centers as well as countless houses—has been built over streams and marshes, and plastic bags clog drainage networks. There’s already concern that the Chennai floods are having worldwide economic impact, particularly in IT. 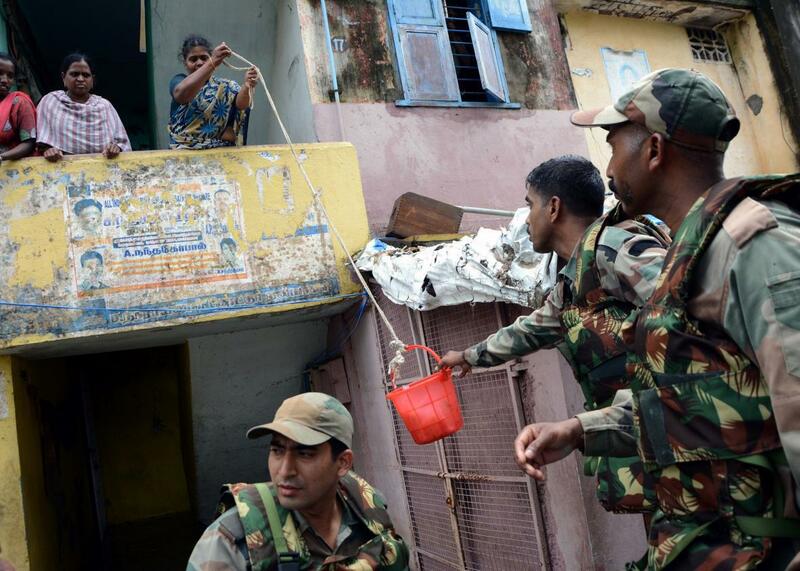 Indian army personnel deliver supplies to residents trapped by floodwaters in Chennai on December 4, 2015. Chennai native Nambi Appadurai, who works for the World Resources Institute in India, sees the irony in his family’s situation: They’ve been displaced by the flooding, and are now temporarily living in a guesthouse at the Indian Institute of Technology. In an email, he said the situation in Chennai is “unprecedented” and India simply hasn’t been able to change fast enough—the climate is changing faster. Meanwhile, India’s delegation at the United Nations climate change talks in Paris have emerged as a driving force. But as powerful as India has become on the world stage, it’s events like the Chennai floods that highlight the incredible task the world faces when it comes to adapting to climate change in real time. The next Chennai could be anywhere: Dhaka, Shanghai, Dar es Salaam, Havana. A strong agreement in Paris will undoubtedly help, but more unnatural disasters this century are virtually guaranteed. 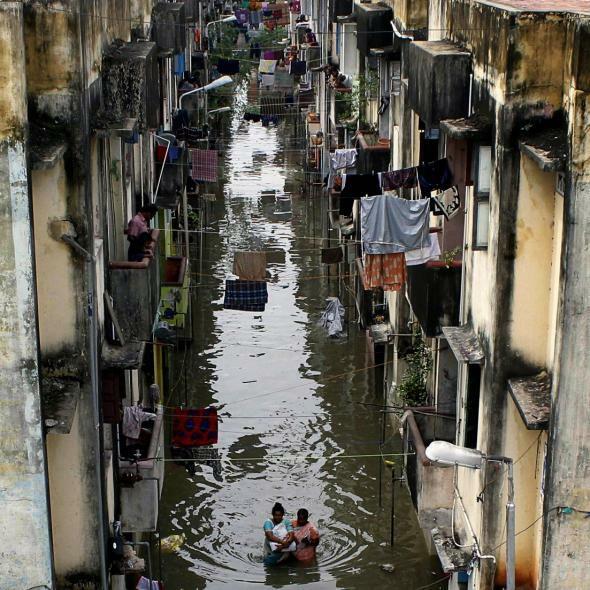 Indian people gather on top and below of a residential area flooded after heavy rains in Chennai on November 18, 2015.